Should you sell the swather? The thought of eliminating a pass over the field and more than $175,000 in capital equipment is tempting. Nathan Gregg, a researcher at the Prairie Agriculture Machinery Institute (PAMI) investigated whether straight-cutting canola was a viable option compared to swathing. “There really isn’t that much to talk about regarding the comparisons between swathing and the direct cut headers that we tested. They all performed relatively well without much difference in loss,” Gregg said at Alberta Canola’s Science-O-Rama in Nisku, Alta., in March 2018. 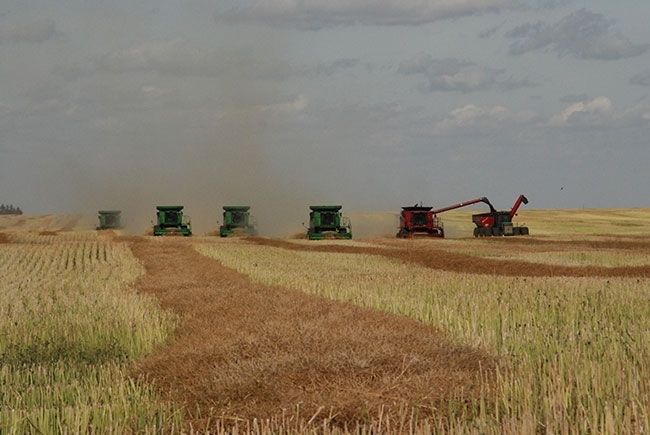 The research compared swathing canola and harvesting with a combine belt pick up to three headers: 36-foot draper header with rotary divider; 35-foot rigid header with vertical knife; and 35-foot Varifeed with vertical knife and an extendable cutterbar out to 23 inches. The research wasn’t about comparing specific brands of equipment, but rather was meant to represent the categories of headers available and used in Western Canada. Ground speed and harvest loss out the back of the combine were fixed across all treatments. Conventional and shatter-resistant Liberty Link hybrid canola were also compared. Replicated trials were conducted at Agriculture and Agri-Food Canada in Swift Current and at the Indian Head Agriculture Research Foundation during all three years. In Humboldt in 2015 and 2016, the equipment was also used to try out different harvest approaches, but was not replicated. Rather than focusing on specific data, Gregg says the most important results coming out of his three-year study from 2014 through 2016 was their experiences from year-to-year and site-to-site. The research found that all headers were viable options. Gregg says there were minor differences found in yield, header seed loss, feeding performance and ground following ability. Losses were highest at the header edges at the dividers and in the middle of the header. Generally, the Varifeed header had the lowest harvest loss, attributed to moving the knife forward. The extendable cutterbar allowed feeding optimization depending on crop density. The combine operators said it was the easiest to use and manage harvest loss. “They called it the ‘idiot-proof’ header. That’s got to count for something,” Gregg says. The auger header was found to be more positive in moving the canola to the feeder than the draper header. The draper was more sensitive to reel position and required more adjustments. In lodged canola, a rigid header was more difficult to use, and required an auto header-height control. Looking across the header width, the highest loss was at the end dividers. The vertical knife and stationary dividers typically had lower losses than the rotary divider. The first year of trials showed the risks and rewards of straight-cut canola. In Swift Current in 2014, the grain was dry but the undergrowth and straw was green in the straight cut area. Straight cutting had lots of plugging issues during harvesting and overall harvesting productivity was low compared to swathed canola. “That loss of productivity was more important than the yield data. The expense of such a slow harvest would have been high,” Gregg says. On the other hand, in Indian Head in 2014, the swathed canola suffered from a big wind event where the swaths were blown around the field. The standing canola didn’t suffer the same yield loss and with dry straw, harvest was efficient. “Those two sites summed up the two ends of the spectrum of learning some of what you need to know about straight cutting canola,” he says. Variety selection was important. Regardless of header type, the conventional variety had higher harvest loss during straight combining than the shatter-resistant variety. “If you are going to straight-cut canola, it is probably a good hedge to use a shatter-resistant variety,” Gregg says. Gregg says that most producers, using their existing equipment could have success with straight-cut canola. It comes down to what risk and harvest management strategy works best on each farm. “I don’t have the answer on whether to sell the swather. It depends on your own circumstances,” Gregg says.